Story Synthesis: Best Activity Ever! There are some activities that transcend classrooms, ages, and ability levels. These are the golden activities that have big ideas that can be explored and examined again and again. Even better are the amazing activities that don't require a great deal of preparation. 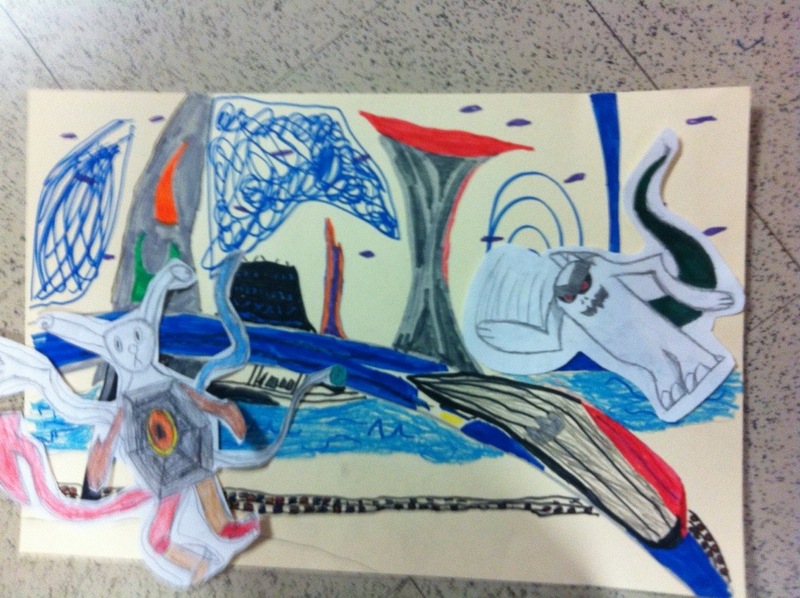 The Story Synthesis is one of those activities. It's very simple--I learned about it from a kindergarten teacher. But I've done it again and again, with different groups of students, and it never fails to captivate and engage them. Split the class into groups. One half of the class creates characters, and one half creates settings. They do this apart from one another, preferably in secret. (If you say that something is "Top Secret", it instantly becomes alluring and exciting!) Then, they get together. They have to introduce the characters to the setting and create a story. What kind of conflict could arise from this situation? This year, I had students work in pairs to create either settings or characters. We kept the characters hidden in envelopes over the several days that it took us to create them. The settings were on large pieces of poster board and were kept in a drawer. After students worked on either characters or settings, it was time for them to get together! I had made the groups several weeks ago (and I still had the paper that I had written them down on! ), so even I was surprised at how things turned out. 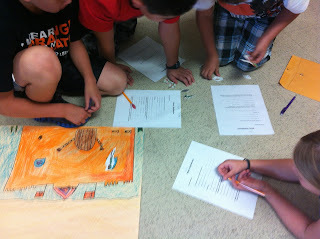 There were laughs and groans as the groups were created. Two girls who worked on SuperDog and Hero Fairy (best character ever!) were paired with an underwater setting. The "army guy medics" were sent to a medieval castle. And this led to some interesting conversations. What kind of conflict could occur with SuperDog and Hero Fairy? How would the underwater setting affect the conflict? Which character was the protagonist? How could the conflict in the story be classified? This year, I did make a quick little sheet to give students some guidance as they worked to answer these questions. But the activity could easily be scaled down for younger students. After students fleshed out the basics of their story (and learned a great deal about compromise in the bargain), they got to use the characters to act out the story in the setting. The final step, which we haven't done yet, is to write it out. I love this activity because it gets kids quickly to deep thinking about stories. How do characters and settings interact? How does the conflict relate to both? It gets them saying vocabulary words ("The protagonist should be...." "Medusa is the villain!"..."Mrs. Kissner, I forget. What does the present mean again?") and working with each other. But by early October, I also have a very clear picture of the task that I must accomplish by the end of the year. Looking at the DRA scores of my struggling readers, it was easy to feel daunted by the expectations of the Common Core to get these readers into grade-level reading selections. "How can I do this?" I asked my husband. "How can I get someone at a DRA 18 into a level 40 book?" My husband, who teaches third grade, was a little calmer than I was. He also has a longer memory. He said, "Didn't you write a whole chapter about that in your book?" "But it's--" I started, ready to argue, and then I stopped because I realized that he was right. 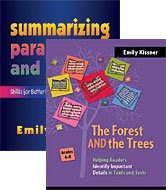 There it was, in The Forest and the Trees, a long section about giving different kinds of support to readers as they work with grade level text. Right. So I do know how to do this, I thought. As I planned for the upcoming weeks of instruction, I considered my readers carefully. The notion of before, during, and after has helped me to frame my lessons. To build automaticity with the words in the grade level text, I've been making speed drills, flash cards, and word sorts. These look different depending on the text and the groups. For Weslandia, I pulled out one and two-syllable words. One group focused on the one-syllable words. Words like loom, built, and wove are a real challenge for them. With another group, I worked on syllabication strategies. We worked on words from the text like civilization, innovation, and devise. With each of these lessons, I focused on using a decoding strategy that wouldn't just help students with words from this text, but would help them to decode words in future texts as well. For Molly's Pilgrim, I pulled out all of the compound words. I made cards by separating them (school/yard) and then we put them back together. In this case, I focused on understanding the compound words. Many students had never heard of a "schoolyard" before, so we talked about making sense of the compound word by putting together the meanings of the other words. I included some other words on the speed drill as well, organized by the number of syllables, so that it was easy to listen to tailor the list for different readers and listen to them read the words over multiple days. With each of these activities, I also used the words that we practiced to build predictions for the text. "In the text we'll read next week, Molly has trouble reading the word Thanksgiving. Why do you think this might be?" Then we shared our thoughts about why this might happen in the story. It's also important to build background knowledge for all readers. While we were working with Weslandia, I wrote a short little passage about the Roman civilization for students to read as their homework fluency practice. This passage got them to say the word "civilization" repeatedly throughout the week. Because we are also starting our study of Greek and Latin roots, this text built some instant connections between our reading and word study. I am also working this year to give every reader the chance to independently interact with grade level or approaching grade level text. To make this successful, I have to think very carefully about the sustaining strategies that they will use. Where will they have difficulty? What can I do to support them? The syllabication strategies we practiced before reading become very important here, as readers have to try to figure out words on their own. This goes hand in hand with the "clicks and clunks" that we've already practiced. Identifying where meaning breaks down is a necessary step to better comprehension. If struggling readers aren't aware of what difficulties they are having, they can't utilize better strategies! After we spend time reading silently, we can talk about where those clunks occurred and how we can fix them. I also like to use these activities to help readers make meaning in a text. Embedded questions are simply questions that you insert into the main body of the text. They are a wonderful scaffold for helping readers to make inferences as they read. Think about the key ideas that a reader will need to gather from a section, and then write a question that cues them to think about those ideas. Reading road maps are similar. They are based in the idea that reading is like a journey. Sometimes they are organized as before, during, and after, as this example. I've stopped trying to make mine "cute" and use a simple table design. After students have read the text and we've talked about our clicks and clunks, we go deeper into analyzing the story. Struggling readers and ELL students really benefit from having a notebook full of resources to help them answer questions. For example, consider character traits. A question might ask, "What trait of the main character helps her to resolve the conflict?" A student who needs help in reading will benefit tremendously from having a list of character traits to refer to while answering this question. This list will help the reader to be able to focus on gathering the text details to support an answer to this question. Lists of themes work in the same way. When a reader has a list of universal themes to refer to, identifying and supporting a theme becomes a much easier task. Getting students who are reading significantly below grade level to comprehend grade level text is a tough task. By planning scaffolding before, during, and after reading, I can help to make the task a little easier. Earlier this week I had the pleasure of pulling out my presentation suitcases and doing a presentation about summarizing. I've been presenting on this topic for about five years now, but each time is new and interesting. There are just so many nuances to teaching summarizing, so many things to consider as I try to find that right match between reader and task. I decided to structure the presentation in a new way this time, looking at several ways that classroom teachers can easily build summarizing skills in students. Here are three that work well for me in my classroom. I love retelling as an instructional strategy for any grade level. For students who seem to be having trouble remembering information from a text, retelling with a partner can be a good place to begin. 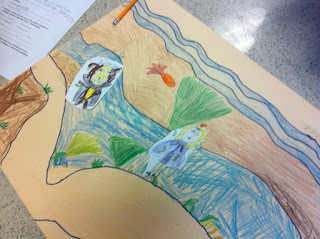 I especially like having students use pictures or props to retell a text. Don't neglect retelling nonfiction. Here are some simple directions that I give to students as they retell nonfiction. Paraphrasing is simply restating an author's words in a new way. This can be a difficult task for students who lack a wide bank of vocabulary words. Working with shorter pieces of text helps to build these skills a little at a time. I like to project a page or a paragraph from a text and have students paraphrase the events or the information. This is pretty quick, and it lets us talk about the challenges that the text poses. What lists do we need to collapse? How can we find other ways to arrange the sentences? Besides helping students to improve their summarizing skills, paraphrasing parts of texts will also help students to put together text evidence to support their answers to open-ended questions. Another way to make this an engaging task is to show students a summary with wrong answers filled in. Why are they wrong? What details from the text can show this? Teaching students to summarize is hard. The most important thing to keep in mind, however, is that summarizing must be revisited again and again. It can't be a single unit that you teach once and then put aside. Instead, students need to see summarizing activities with every text. Whether you are retelling, paraphrasing parts of text, or using a scaffolded summary, ongoing activities will help your students to be successful. Right now, we've come up with a very workable arrangement for our co-teaching class. It's a model that works well and limits the number of transitions. This arrangement needs one hour in which 3 people are available to share a class. Right now, it works wonderfully because I have a student teacher. Later in the school year...well, I won't worry about that for now. One of my problems with the standard model of guided reading is the amount of time that students spend left to their own devices. There are many students who can manage this, and succeed very well. However, for struggling readers, forty-five minutes of independent work can leave them spinning their wheels instead of moving forward. Last year, when there were three of us working with one class, we tried using three sessions. But this led to too many transitions. Parallel teaching, in which the same lessons are delivered in different groups, left us feeling even more fragmented. We wanted some feeling of together-ness, that feeling of "our class" and not "my group, your group." So we came up with this arrangement. It works well and targets support at the kids who really need it. We used a combination of assessment tools to do this. We've come up with two groups that are intensive and two groups that are strategic. For the sake of discussion, let's call the groups North, South, East, and West. Begin the class with independent reading. With kids arriving from different classes, it's important to have a calm, quiet routine for the start of class. We use the 10 minutes at the start to share information and (when all is well) listen in on readers and maintain a robust independent reading program. The hour block is broken into 2 sessions. Teacher A: One teacher devotes planning and instruction to core instruction. This teacher creates a half-hour lesson to present two times during the hour long block--once to groups North and East, and once to groups South and West. This lesson is focused on using grade level text and grade level curriculum. With only 12-15 kids in the session, Teacher A can focus on really working deeply with the core text and grade level activities. When I teach the core, I have kids sitting on the carpet with clipboards, pencils, and partners. Teacher B: This teacher alternates between seeing North and South on one day, and East and West on the other. This teacher focuses on guided reading with leveled text at the groups' instructional levels. Teacher C: This third teacher could follow two pathways. In one scenario, Teachers B and C would both run guided reading groups, enabling all readers to have guided reading every day. In the other scenario (which we are using right now), Teacher C does word work related to the core reading selection. I'll be Teacher C in the next few weeks. Our phonics and fluency screenings show that our kids need intensive work on word recognition and multisyllabic words. I'm going to work on these topics using words and sentences that I am pulling from our grade level core texts. I'll work a few days ahead, giving kids the word background they need to be more successful with the grade level text. After the 60-minute block, kids return to my classroom. This regrouping time really is just our chance to make sure that folders are returned, books are put away, and so forth. I like to put up something fun on the Promethean board during this time--lately the kids have been loving the Scholastic book trailers available here. Sometimes I show YouTube videos related to our core reading selection. I keep this time relaxed and light-hearted to end on a high note every day. I hate teaching plans that require superhuman concentration and stamina. When I get that breathless, overwhelmed feeling, I know that I'm not being as effective as I can be. On one day out of the cycle, we go to the computer lab for Study Island games and other computer-based practice. This gives us a chance to do progress monitoring and assessments without sacrificing instruction. We can also sit together for a few minutes in the lab to share student work and make plans for the next cycle. -Writing and spelling are taught outside of these sessions. How do you make co-teaching work at your schools?